Son of Champion DEPUTY MINISTER, Leading Sire of 90 SWs and sire of leading sires AWESOME AGAIN (sire of Champion GINGER PUNCH), SILVER DEPUTY, TOUCH GOLD, etc. DOINGHARDTIMEAGAIN (2010 f, by Conquistador Cielo) In US, 6 wins, 2 to 4, $734,304 (US SSI = 10.14): 19. 1st Melair S.-R ($137,500, BHP) $245,000, 1st Great Lady M S. [G2] ($200,500, LRC), 1st Soviet Problem S.-R ($110,000, BHP) $196,000, 1st Evening Jewel S.-R ($110,000, SA) $200,750, 1st Hollywood Oaks [G2] ($150,000, BHP), 2nd Keith E. Card California Cup Juvenile Fillies S. ( ($47,500, SA) $250,000, 2nd Sweet Life S. ($19,770, SA) $81,850, 3rd Kalookan Queen S. [L] ($12,168, SA) $95,850, 3rd Zia Park Distaff S. ($8,120, ZIA) $81,375. Ntr Los Alamitos Race Course 6 1/2f 01:15.59 2014. TIZ A MINISTER (2010 c, by Cee’s Tizzy) In US, 3 wins at 2 and 3, $481,530 (US SSI = 5.80): 20. 1st California Breeders Champion S.-R ($165,000, SA) $300,500, 1st Affirmed H. [G3] ($100,750, BHP), 2nd Swaps S. [G2] ($147,000, BHP), 3rd San Felipe S. [G2] ($300,750, SA), 3rd Snow Chief S.-R ($33,000, BHP) $300,000, 3rd California Flag H.-R ($12,000, SA) $101,250, 3rd El Cajon S. [L] ($12,000, DMR) $100,500. SHE’S ORDAINED (2009 f, by Not for Love) In US, 15 wins, 3 to 6, $469,650 (US SSI = 3.63): 39. 1st Willa On the Move S. ($60,000, LRL) $100,000, 2nd Lady in Waiting S. ($29,100, PEN) $150,000, 2nd Regret S. [L] ($20,000, MTH) $127,000, 2nd What a Summer S. ($20,000, LRL) $100,000, 2nd What A Summer S. ($20,000, LRL) $100,000, 2nd Dashing Beauty S. ($10,000, DEL) $58,000, 3rd Sweet and Sassy S. [L] ($11,000, DEL) $107,750, 3rd Cornucopia S. [L] ($8,250, PRX) $75,000, 3rdSkipat S.
MR. HINX, 5 wins at 3, $438,548, Real Good Deal S., Echo Eddie S., 2nd Santa Anita Sprint Championship S. G1., Damascus S.
CURVY CAT (2009 f, by Distorted Humor) In US, 10 wins, 3 to 5, $386,055 (US SSI = 4.60): 27. 1st B. Thoughtful S.-R ($71,250, BHP) $126,000, 2nd Cat’s Cradle H.-R ($20,000, BHP) $100,000, 3rd Paseana H. ($12,120, SA) $81,700, 3rd Skillful Joy S. ($10,512, BHP) $70,440. SINGING KITTY (2012 f, by Unbridled’s Song) In US, 5 wins at 2 and 3, $398,478, China Doll S., Xpressbet California Cup Oaks, Unzip Me S., 2nd Sandy Blue H., Fran’s Valentine S., 3rd Autumn Miss S. G3, Solana Beach S.
GOING FOR A SPIN (2008 f, by Mr. Greeley) In US, 7 wins, 2 to 5, $338,404 (US SSI = 3.39): 33. 1st Cat’s Cradle H.-R ($48,200, BHP) $78,200, 1st Warren’s Thoroughbreds S. [N] ($42,000, HOL) $70,400, 1st Pennies From Heaven Starter H. [N] ($29,340, SA) $46,700, 1st E. B. Johnston S.-R ($28,500, FPX) $50,000, 2nd B. Thoughtful S.-R ($23,750, BHP) $125,000, 3rd Miss America S. ($7,800, GG) $64,300, 3rd Las Madrinas H. ($6,000, FPX) $50,000. POPALICIOUS, 8 wins, 3 to 6, $315,984, First Lady H., 2nd El Diario H., 3rd First Lady H.
FLY TO MARS, 5 wins, 3 to 4, 2018, $327,358, California Dreamin’ S. NCR, 2nd Clocker’s Corner S., City of Hope s., 3rd Del Mar Mile H. G2. 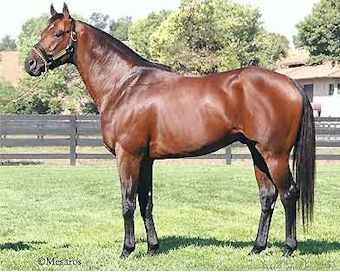 BAILOUTTHEMINISTER (2008 g, by Smokester) In US, 7 wins, 3 to 5, $242,154 (US SSI = 3.97): 20. 1st Sam J. Whiting Memorial H. [L] ($45,000, PLN) $75,000. BELLA LUMA, 5 wins, 2 to 4, placed at 5, 2019, $191,723, Golden Poppy S.
SWISS WILD CAT (2008 f, by Swiss Yodeler) In US, 3 wins at 2, $189,552 (US SSI = 4.94): 10. 1st California Thoroughbred Breeders’ Association S. ( ($60,000, DMR) $100,000, 1st Robert H. Walter California Cup Juvenile Fillies S ($45,000, OTH) $75,000, 2nd Cinderella S. ($15,960, HOL) $70,200, 2nd Phil D. Shepherd S. ($9,500, FPX) $50,000. REGINELLA, 4 wins, 3 to 4, $153,291, Emerald Distaff H., Delta Colleen H., 2nd Boeing S., 3rd Washington Oaks. MINISTER OF SOUL, 6 wins, 4 to 5, 2019, $154,203, Phoenix Gold Cup H., 2nd Bill Thomas S.
Lifetime progeny earnings over $18.7 million and 19 black-type winners. The 8th ranked 2016 California sire; with over $2 million in progeny earnings! The 6th ranked 2017 California sire with over $2.1 million! The 9th ranked 2018 California sire with over $2.1 in progeny earnings! By DEPUTY MINISTER (1979), Horse of The Year, Champion twice, $696,964. Sire of 21 crops. 1141 foals, 869 starters, 90 black type winners, 602 winners, $83,708,522, including Open Mind (Champion twice, $1,844,372), Go For Wand (Champion twice, $1,373,338), Dehere (Champion, $723,712), Diva’s Debut (Champion, $262,983), Mongol Warrior (Champion twice, $232,423), Hello Seattle (Champion, $149,699), Awesome Again ($4,374,590, Breeders’ Cup Classic [G1], etc. ), Deputy Commander ($1,906,640, Travers S. [G1], etc. ), Touch Gold ($1,679,907, Buick Haskell Invitational Handicap [G1], etc.). WAR CHANT (c, by Danzig). 5 wins at 2 and 3, $1,130,600, in NA/US. Won Breeders’ Cup Mile S. [G1], Oak Tree Breeders’ Cup Mile S. [G2], San Rafael S. [G2], 2nd Santa Anita Derby [G1]. Sire. IVAN DENISOVICH (IRE) (c, by Danehill). Placed at 3, $140,000, in US. 2nd Secretariat S. [G1], 3rd Hollywood Derby [G1]. At 2 Sent To U.S.A. At 8 Sent To Chile. Winner at 2, in Eng, 35,425 GBP. Placed at 2, in Fr, 80,010 EUR. Winner at 2 and 3, in IRE, $61,161. Won July S. [G2] (ENG), Solonaway S. (IRE), 2nd Pr Morny [G1] (FR), 3rd St. James’s Palace S. [G1] (ENG). (Total: $437,399) Sire. MINISTERS WILD CAT (c, by Deputy Minister). Black type winner, see records. Delano. 3 wins at 3, $97,866, in US. Bold Warrior (c, by Bernardini). 3 wins at 3, 2011, $117,700, in US. 2nd Chief Tamanaco S. [O] (BEL, $12,000). Royal Fortune. Winner at 3, $97,522, in US. HOLLYWOOD WILDCAT (f, by Kris S.). Champion, see above. Hollywood Baldcat (f, by Kris S.). 3 wins at 3 and 4, $125,535, in NA/US. 3rd Bewitch S. [G3]. Producer. David’s Wildcat (c, by Sunny North). 7 wins, 2 to 4, $50,259, in NA/US. 3rd Hypnotized Starter H. (1st Leg) [N] (CRC, $1,540), Hypnotized Starter H. (2nd Leg) [N] (CRC, $1,689). MARIRV (g, by *Sensitivo). 5 wins at 3 and 5, $54,151, in NA/US. At 6 Sent To PuerTo Rico. Won Cl Jose De Diego -G2 (PR), 2nd Cl George Washington -G3 (PR), 3rd Cl Juan Ponce De Leon -G3 (PR). Smooth Healer (c, by Dr. Blum). 2 wins at 3, $21,410, in NA/US. TRIOMPHE (CHI) (f, by Nobloys (FR)). Placed at 6, $7,800, in NA/US. At 5 Sent To USA. Won Pr Ilustre Muncipalidad De Santiago [G1] (CHI), 2nd Pr Cuerpo Diplimatico (CHI), 3rd Pr Francisco Baeza S. [G1] (CHI), 4th Pr Geoffrey Bushell [G3] (CHI). Producer. =WAR PAINT (CHI) (f, by Worldwatch). Won Pr Carlos Aguiar (CHI). =ESTATICO (CHI) (c, by Worldwatch). Won Pr Jose Luis Larrain (CHI), 2nd Pr Ignacio Urrutia De La Sotta (CHI), 3rd Pr Thompson Matthews [G3] (CHI). =Not Enough (CHI) (c, by Nobloys (FR)). 2nd Copa El Mercurio [G3] (CHI). =Graceland (CHI). Unraced. Dam of =PUESTA DE SOL (CHI) (f, by Sam M. Won Pr Luis Davila Larrain (CHI).). Granddam of =Impaciencia (Chi) (f, by Sam M. 3rd Pr Luis Davila Larrain (CHI).). =Sensitive (CHI). Unraced. Dam of =WEEPING (CHI) (c, by Worldwatch. Won Pr Francisco Astaburuaga A. [G3] (CHI), 3rd Pr Carabineros De Chile (CHI). ), =Waco (CHI) (c, by Worldwatch. 3rd Pr Carabineros De Chile (CHI).). Granddam of =CONSERVATORIO (CHI) (c, by Hussonet. Won Pr Fernando Moller Bordeu [G2] (CHI), 3rd Pr Libertador Bernardo O’Higgins R. [G3] (CHI). ), Hortense (Chi) (f, by Hussonet. Placed at 4 and 5, $68,535, in NA/US. 2nd Sam Houston Turf Sprint Cup S. [O] (HOU, $10,000).). Elizabeth Long (f, by Mr. Long). 5 wins, 3 to 5, $16,507, in NA/US. Drs. Nite Out (c, by Dr. Blum). Winner at 3 and 5, $10,194, in NA/US. Ms. Arla. 3 wins at 2 and 3, $58,620, in NA/US. 13 wins, 4 to 7, $78,575, in PR. (Total: $137,195) Producer. Elizabeth K. (f, by Third Martini). Black type placed winner, see above. Spiked Apple (c, by Beau Purple). 7 wins, 4 to 6, $54,300, in NA/US. Sire. Jelly Apple (c, by Peace Corps). 6 wins, 2 to 5, $48,910, in NA/US. Kcaj (c, by Cornish Prince). 10 wins, 3 to 6, $40,005, in NA/US. Big Apple (c, by Handsome Kid). 5 wins at 3 and 4, $37,133, in NA/US. Delicious Apple (c, by Handsome Boy). 5 wins, 4 to 6, $33,972, in NA/US. Apple On A Stick (f, by Third Martini). 5 wins at 3, $15,305, in NA/US. Apple Pancake (f, by Water Prince). Winner at 2 and 3, $10,500, in NA/US. Producer. Bobbing For Apples (f, by Duck Dance). Winner at 4, $10,126, in NA/US. Producer. Tax Me. 8 wins, 3 to 6, $102,210, in NA/US. Parsnip (c, by Beau Gar). 3 wins at 5 and 6, $6,790, in NA/US. Stewed Apple (c, by Third Martini). 4 wins at 4, $5,380, in NA/US. Race Record: (In NA/US) at 2, once 2nd; at 3, two wins (Golden State Mile S. [O] (GG$33,650)), twice 2nd (El Camino Real Derby [G3], Affirmed Handicap [G3]); at 4, one win, twice 2nd, once 3rd; at 5, unplaced. (In Can) at 5, three wins (Jacques Cartier S. [L] (WO$66,843)), once 3rd (Bold Venture Handicap [L] (WO$12,347)). Total: 6 wins, 5 times 2nd, twice 3rd. Earned $368,729. August 12, 2018 Reginella Takes Emerald Distaff H.
April 8, 2017 Ministers Wild Cat Son Takes Rich Echo Eddie S.
February 2017 California Thoroughbred MINISTERS WILD CAT’S Promising 3 Year-Old Son MR.HINX by 2¼ at First Asking!! May 30, 2016 Ministers Wild Cat Daughter Takes First Lady H.